The paint department at Pascagoula, Miss.-based Ingalls Shipbuilding has developed an innovative method of accomplishing business in surface preparation and painting process — saving the U.S. Navy on ship upkeep and maintenance. The main premise here is reaching a goal of improving the life cycle of all Ingalls-constructed destroyers. "We have started a new process of cleaning and painting the assemblies before we stack them on top of one another," said paint foreman Tommy Vick. "Now we can reach almost all surfaces, even those we cannot see or reach with hand tools. By bringing the assemblies down to the bare metal and with our new technique, the paint will adhere better and last longer, keeping corrosion down on the interior and exterior surfaces." The extension of a ship's life cycle involves a new procedure consisting of a new abrasive medium. "We replace Black Beauty with Bar Shot in the process of cleaning assemblies," said paint foreman Jon Evans. "The contract specification allows us to power tool clean any damaged painted areas. With this new abrasive material, we can exceed the contract specifications with a better surface preparation. 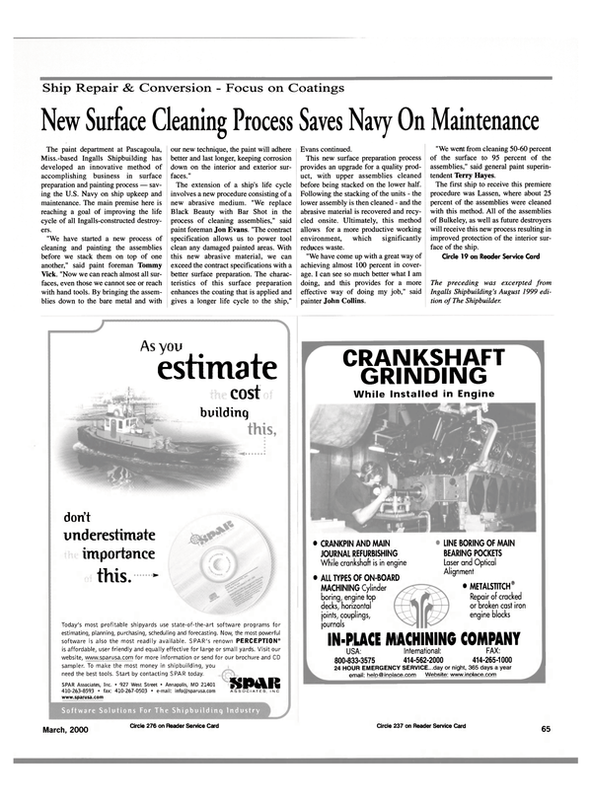 The characteristics of this surface preparation enhances the coating that is applied and gives a longer life cycle to the ship," Evans continued. This new surface preparation process provides an upgrade for a quality product, with upper assemblies cleaned before being stacked on the lower half. Following the stacking of the units - the lower assembly is then cleaned - and the abrasive material is recovered and recycled onsite. Ultimately, this method allows for a more productive working environment, which significantly reduces waste. "We have come up with a great way of achieving almost 100 percent in coverage. I can see so much better what I am doing, and this provides for a more effective way of doing my job," said painter John Collins. "We went from cleaning 50-60 percent of the surface to 95 percent of the assemblies," said general paint superintendent Terry Hayes. The first ship to receive this premiere procedure was Lassen, where about 25 percent of the assemblies were cleaned with this method. All of the assemblies of Bulkeley, as well as future destroyers will receive this new process resulting in improved protection of the interior surface of the ship. Circle 19 on Reader Service Card The preceding was excerpted from Ingalls Shipbuilding's August 1999 edition of The Shipbuilder.